I have this internal dilemma when it comes to wood-mounted rubber stamps. 1. They can be really expensive. 2. They’re often hard to organize and take up a lot of storage space. But then there’s 3: rubber stamps are always so stinkin’ cute that I just want them all! I used to go to Stampin’ Up! parties and then spend hours pouring over Stampin’ Up! catalogs until I landed on the one stamp set I just had to have (and could afford with my babysitting money). But I haven’t done that in awhile, because…you, know…money. And then I discovered the dollar bins at Michael’s and sometimes they have the cutest rubber stamps in there–usually seasonal ones. So I started collecting rubber stamps again. But…I wasn’t really using my rubber stamps. 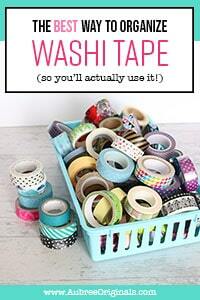 I had the same problem with washi tape, which led me to my washi tape storage post. I have a feeling this might be a recurring theme in this craft room reorganization project: the need for functional storage that allows me to actually see and use my stash. And maybe you’re suffering from the same problem. So, before you go out and buy a new storage system for your stamps, you need to examine what it is, exactly, that you need–for you, your craft space, and your crafting style. I think this is the most important! Out of sight, out of mind, right? You need to organize your stamps in a way that allows you to quickly find what you need! 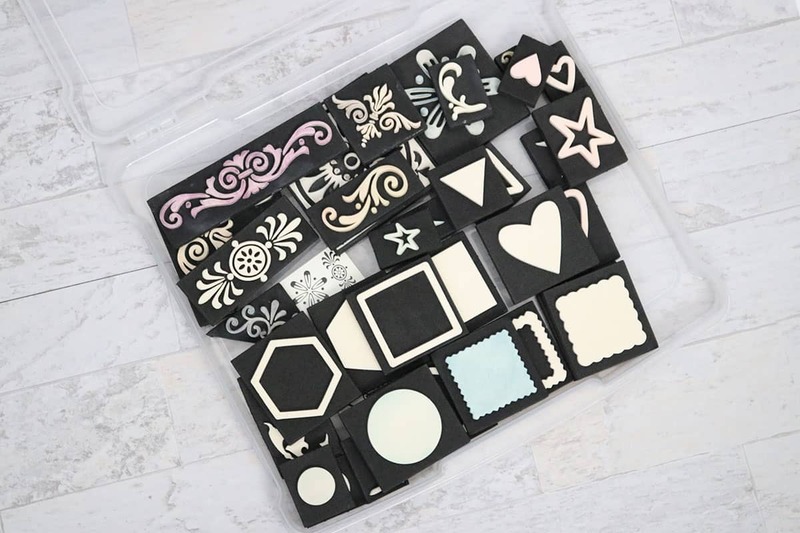 And if you’re like me, stamping is one of those optional papercrafting things–like, I could just as easily get the look I’m going for with a piece of patterned scrapbook paper. So if I actually want to use my rubber stamp stash, then clear, accessible storage is a high priority. Okay, I know, I know. Once I finally show you my finished craft room, you might hate me. Because I’m spoiled and have a rather large craft room (Thanks Jared for sacrificing and taking the smaller spare bedroom as your man cave! Love you!). But even still, stamping is just one of many crafting hobbies for me, so I don’t want my stamps to occupy a whole shelf or precious wall or countertop space. And for some of you, you might only have the top shelf of the linen closet. So this point becomes even more important for those small spaces! This one may or may not apply to you. But I know IKEA is the go-to storage store for a lot of us crafters. I recently subbed out my old storage cubes for an IKEA Kallax and realized that a lot of my plastic scrapbook storage boxes were too wide. And that was kind of a bummer. 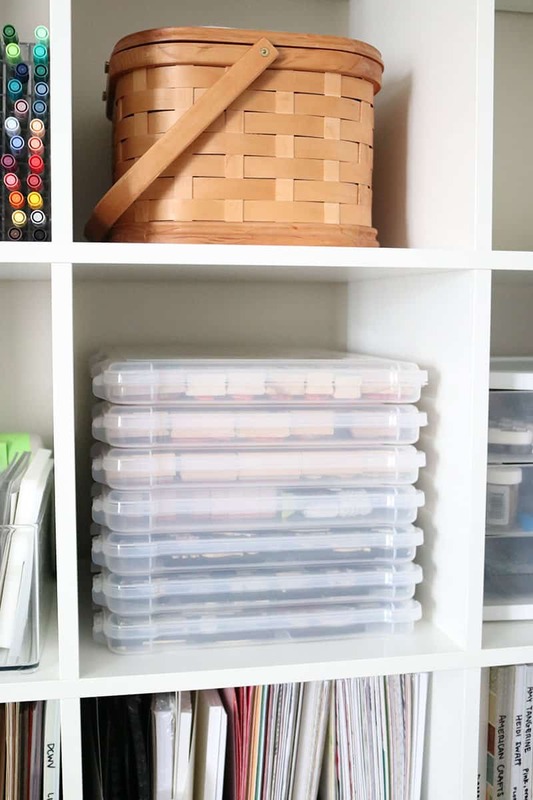 If you don’t have an IKEA storage system, that’s totally okay, but just take my advice and measure your closet, shelf, bookcase–whatever you have–beforehand and keep those measurements in mind before purchasing any stamp storage containers. Ah! Are you ready? This is what you really came here for, after all. I did a lot of research for the perfect stamp containers and ended up with these slim storage cases. I purchased mine online at Michael’s (when they were 50% off) but they may or may not be in stock, depending on when you look. So Amazon is another great option (plus, get free and faster shipping with Amazon Prime!). I absolutely love these storage containers for storing stamps and would highly recommend them. So before I present any other options, let me tell you exactly what I love…and then the one small thing that could potentially be a nuisance (but may or may not bother you). I love how slim they are. 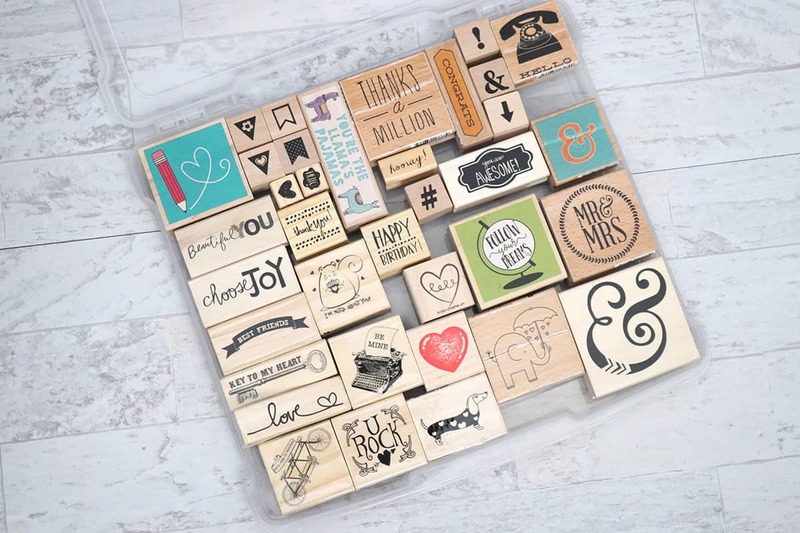 The are the perfect height for wooden stamps to be stored in a single layer, with no wasted space! They allow you to see all of your stamps at a glance (or at least a good chunk of them). They fit in the IKEA Kallax (as opposed to the more widely-available taller cases you’ll find at craft stores, which are a couple inches too wide). Basically, all 3 of my criteria above are being met. Organization win! Not all of the containers snap closed perfectly. It seems to depend on how heavy or full your container is, but sometimes one tab will pop up. It’s not a huge problem for me because I don’t plan on transporting my stamps more than on and off my shelf and to my craft table. If you travel with your crafting supplies or have small children around, then it’s something to be aware of. I’m all about transparency and honesty when promoting products to you! Still, this is one of the best options I’ve found to compactly store rubber stamps and I definitely recommend it! These containers work great for storing foam stamps, too! Bonus: these containers also work great for storing foam stamps! To maximize the space, I simply stack them in two layers (since they’re not quite as tall as wood-mounted rubber stamps). Much easier to find the stamp I’m looking for–compared to when they used to be all mixed up in a drawer! I love these Stamp, Store and Go bags. If I had seen them first, I might have purchased them instead of my slim storage cases. I love that you could store your rubber stamps on a shelf, in a drawer, or better yet: vertically! If you pay attention to the KonMari tidying method at all, vertical storage is everything when it comes to taking inventory of your belongings! If you want to further organize your rubber stamps into smaller categories or types, this 4×6″ photo cases storage container would be a great option! Each photo case is only 1.23″ tall, so you can still store your rubber stamps in a single layer without any wasted space. Depending on what you use your stamps for and how many you have, you may like to store them openly on narrow floating shelves, like these 24 Inch distressed brown floating shelves or even something like this set of U-shaped floating shelves. I personally don’t use my stamps regularly enough to warrant the need for open storage (and I wouldn’t be a huge fan when it came to dusting my craft room). 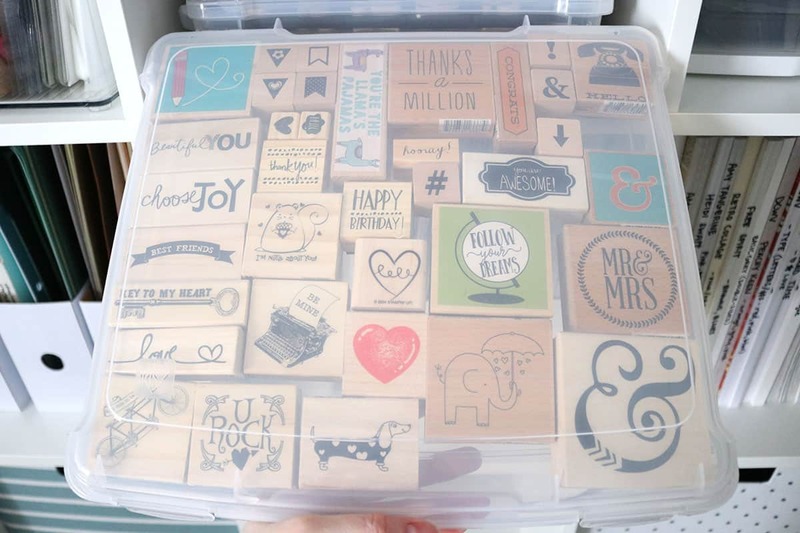 But I think a rubber stamp display could be really cute in the right craft room! 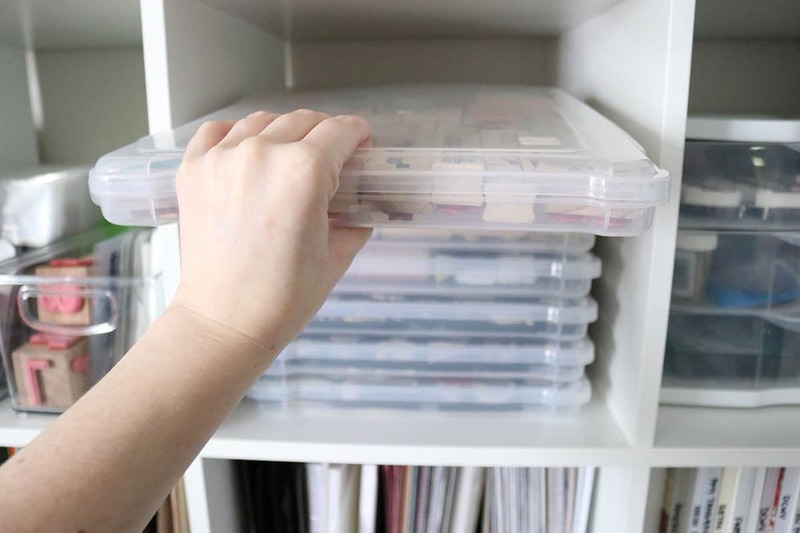 If you already have some bins or drawers in your craft room and just need to find a way to organize your rubber stamps within them, you might find these clear plastic drawer organizers useful. They come in a variety of sizes and they’re stackable. There are multiple ways to organize wood-mounted rubber stamps that will help you easily access your collection and still save space. I am so excited about the option that I chose! Hopefully this gives you some good ideas of what kinds of stamp storage products are available. Get measuring your space and find something that works for you! Was this post helpful? 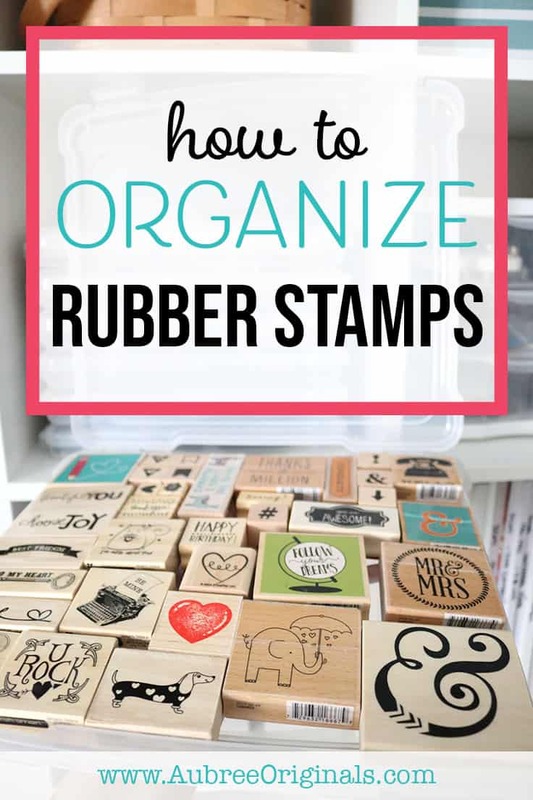 Were you able to finally gain control of your rubber stamp collection with these organization ideas? Let me know in the comments! I’d love to know what’s worked for you! Don’t forget to save for later by pinning to Pinterest! I love it when you share! This is part of my 2-month long series leading up to a full craft room reveal! I have been working so hard on organizing and decorating my craft room and can’t wait to share the end result!